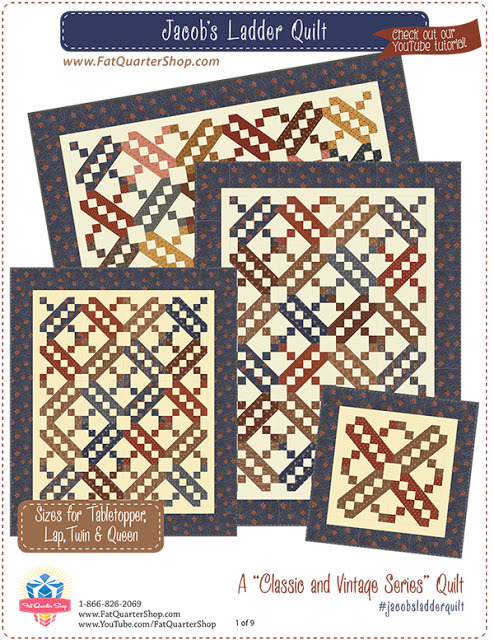 The Fat Quarter Shop has developed another fun Classic and Vintage pattern with the Jacob's Ladder block. They have even made a video. 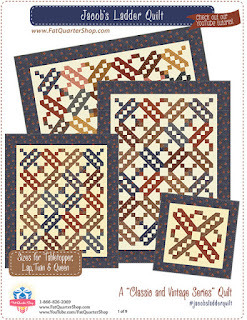 To make a quilt just like The Fat Quarter Shop, they put together a great quilt kit and backing set with Reflections fabric by Jo Morton. If you want to use your stash...well then you can do that too, just like I did. As soon as I saw the quilt along pattern I knew I wanted to do it in scrappy green fabrics. I chose various scraps from my bins that were already cut and ready to piece. One of the REAL advantages to all that sorting I did last year. I am still cutting, sorting and well destashing! and making a 'seasonal' pillow. over at the Jolly Jabber. I just love this pattern, and your fabrics are Perfect! That is so pretty in the greens. What a fun block! Hi Vicki your block looks great. Perfect block for St Patrick's Day! I can't wait to see the full project! Love the fabrics. All the greens play so well! Great little seasonal piece!